"I've moved eight times since I had my daughter. It is not fair to expect people and their children to hop from home to home. The longest I've been in a home is two and a half years." The housing crisis is becoming worse every year, with many private renters saying they struggle to cover housing costs and pay their bills. The number of social homes being built is at its lowest for 70 years, and we face a chronic lack of housing that people can afford. But right now, we have a unique opportunity for change and we must take it. 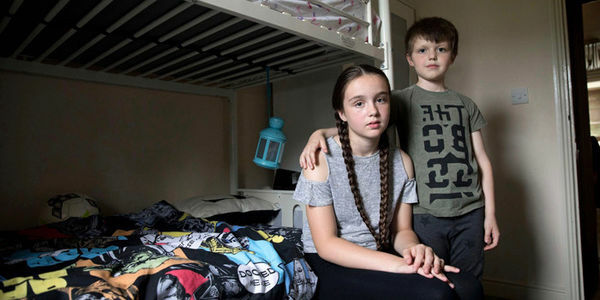 Millions of people just like Lucie are being failed by the housing market and live with the fear and stress of not being able to afford to pay the rent. Even worse, they're often at the mercy of private landlords who can evict them with virtually no notice. Quality, social housing could make a huge difference to people's lives, meaning families like Lucie's (with her young daughter and son) could put down roots, and live without the stress of being forced to move home. Social housing provides the stability of a permanent home, and the chance for millions of families to lead lives where their children are safe and happy. But, with 1.2 million households on the social housing waiting list – and many more in need of it – there isn't nearly enough. This year, the government will undertake its comprehensive spending review. This is one of the biggest opportunities for decades and will determine whether funding is made available for new social homes. Right now is our once-in-a-generation chance. We must act and put pressure on the government to commit to the social housing we so desperately need. Together, we can turn this crisis around.